How do you know if your program works? If it isn’t written, it’s as if it didn’t happen. When you keep track of everything you do in your program, you can show others what you’ve done. “Making sure it works” means making sure that your program meets the needs of both the people in your program and your organization. One way you know this is through an evaluation. Whether it has made a difference in their lives (the impact). When collecting information about people, you must protect their privacy. See Health Information Privacy from the U.S. Department of Health and Human Services. Check with your organization’s leaders to find out what permission you will need to collect data from the people in your program. For example, some organizations are required to go through their Institutional Review Board. Decide how you want to use the evaluation results to strengthen your program. Develop strategies to get the participants to complete the evaluation tools. Learn to plan and prepare traditional meals in a heart healthy way. At least 80% of participants will identify five foods that are low in cholesterol. At least 80% of participants will participate twice a week in a walking group. For more information about writing objectives, visit SMART Objectives. Get more funding and other support. Funders, leaders at your organization, and community members like to see actual examples of how your program helped someone. They like to see that what you have done improved lives. Also, sharing results with your partners helps to ensure their continued support. You can develop a fact sheet that shows what your program has done to promote heart health. 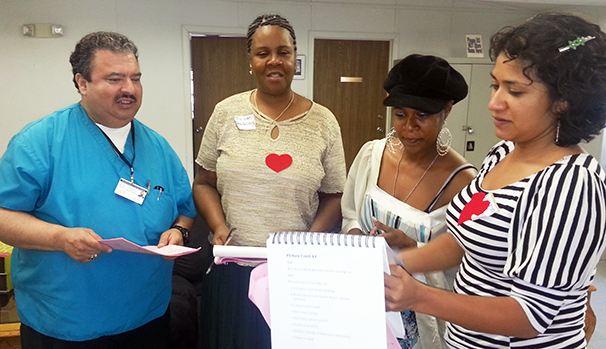 You can also read about the success of programs that have used our heart health manuals. This can give you an idea of what types of information help describe what “success” means to your program.